We love going out to dinner but with a family of five, it can get pricey. But with copycat recipes, we can enjoy some of our favorite food without having to hit the restaurant! 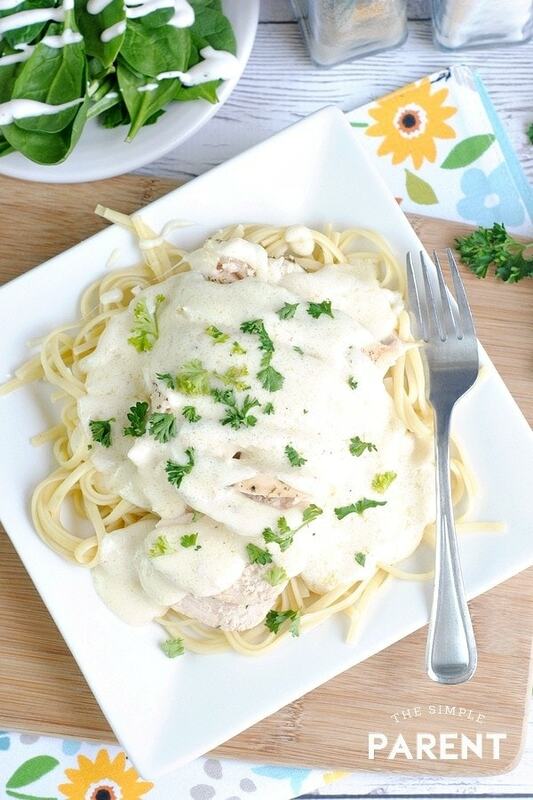 This Olive Garden Chicken Alfredo recipe is a version of one of Justin’s favorite meals at Olive Garden. I’m a soup, salad and breadsticks kind of girl but he’s all about the pasta. 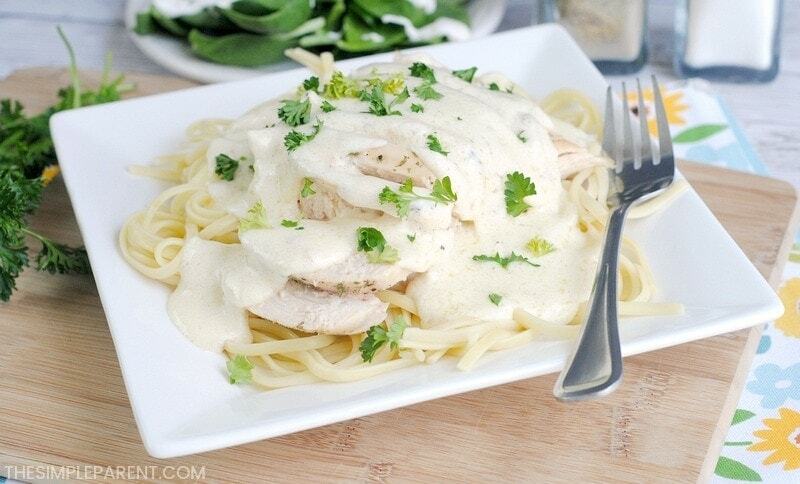 He’s given this Copycat Olive Garden chicken alfredo a thumbs up! The key to making this Olive Garden Chicken Alfredo is making your own sauce. You really can’t get the flavor you want with jarred sauce even though I’m the type who depends a lot on things like premade sauces for our pasta! But taking the time to make your own sauce will make this taste Olive Garden Copycat Chicken Alfredo like you’ve just been seated at your own table for a night out! 1. Preheat the oven to 350 degrees and spray a 9×13 baking dish with non-stick cooking spray. 2. Salt & pepper the chicken breasts and bake for 30-35 minutes. 3. Cook the fettuccine noodles according to package directions. 4. 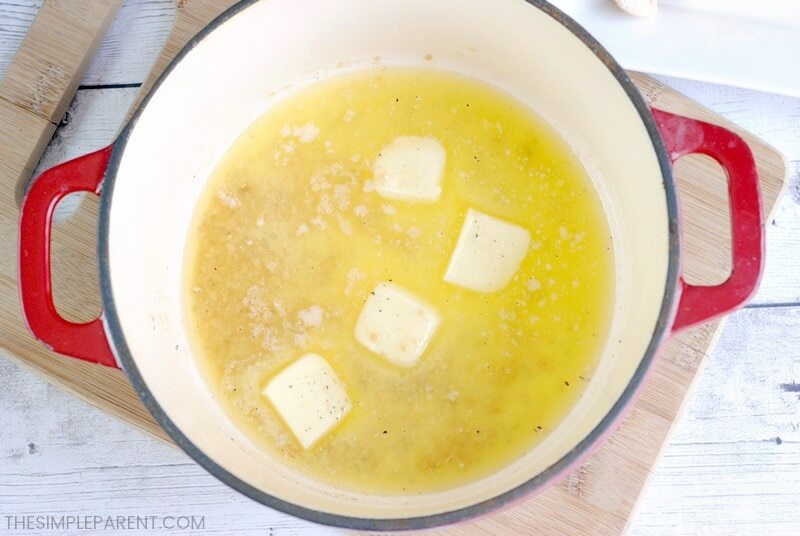 Heat the 1/2 cup of butter and minced garlic in a large saucepan or dutch oven. 5. Whisk in the 2 tablespoons of flour. 6. Add the heavy cream (or Half & Half). 7. Continue to stir until the mixture starts to thicken. 8. 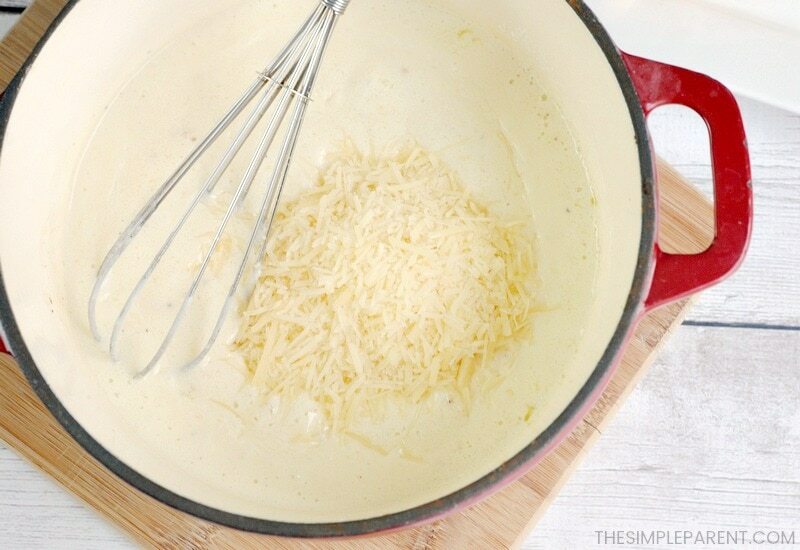 Add in 3/4 cup of Parmesan cheese and stir until completely melted. 9. 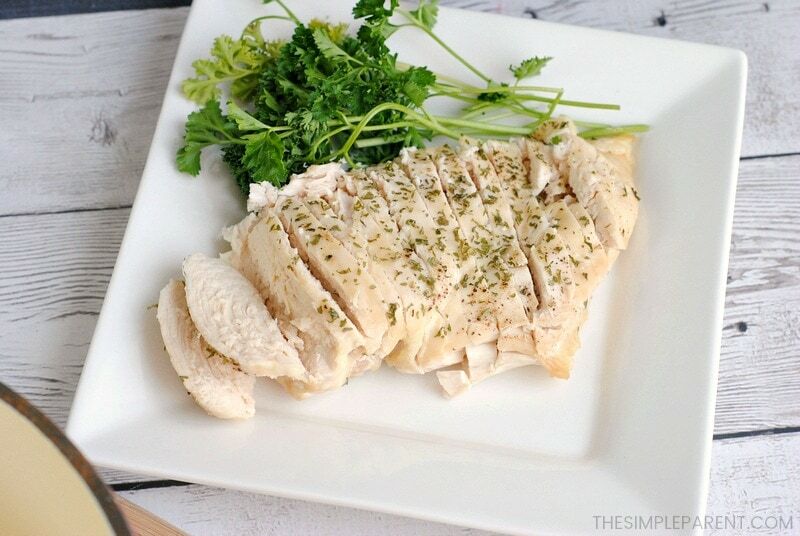 Remove the chicken from the oven and cut into slices. 10. Place the fettuccine noodles on a plate, top with the chicken breast and add alfredo sauce on top. 11. Sprinkle with remaining parmesan and garnish with diced fresh parsley, if desired. Preheat the oven to 350 degrees and spray a 9x13 baking dish with non-stick cooking spray. Salt & pepper the chicken breasts and bake for 30-35 minutes. Cook the fettuccine noodles according to package directions. 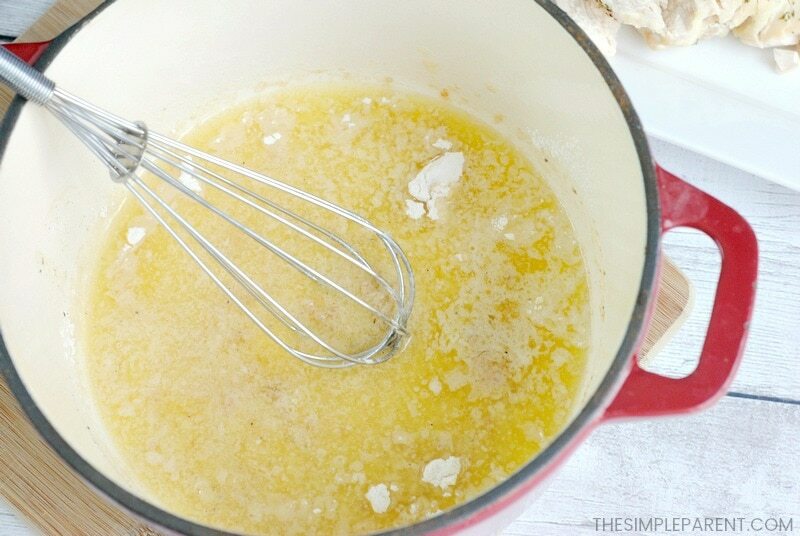 Heat the 1/2 cup of butter and minced garlic in a large saucepan or dutch oven. Whisk in the 2 tablespoons of flour. Add the heavy cream (or Half & Half). Continue to stir until the mixture starts to thicken. Add in 3/4 cup of Parmesan cheese and stir until completely melted. 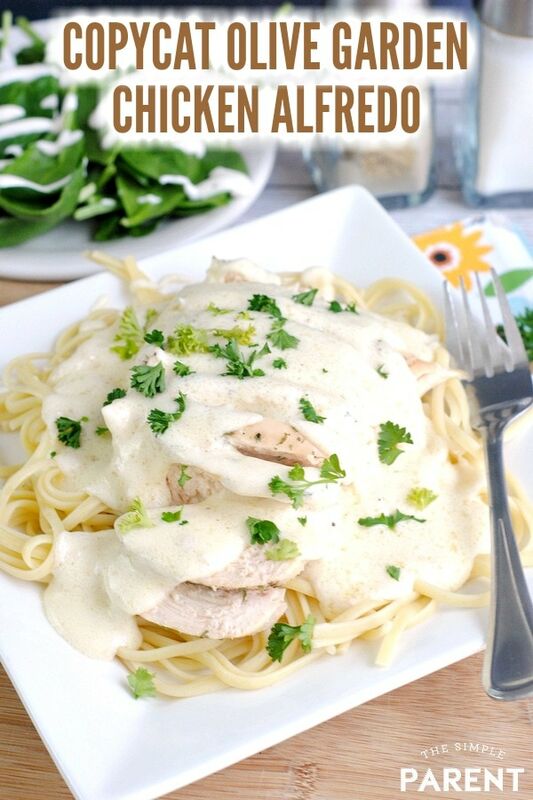 Place the fettuccine noodles on a plate, top with the chicken breast and add alfredo sauce on top. Sprinkle with remaining parmesan and garnish with diced fresh parsley, if desired. 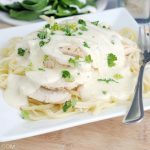 The next time you are craving your favorite dish from Olive Garden but don’t feel like going out, skip the takeout and make your own Chicken Alfredo Olive Garden recipe! It’s easy to make and tastes SO good! You won’t be disappointed! If you want to go all out, pair this recipe with these Copycat Olive Garden breadsticks! For more easy pasta dinners, try our Creamy Feta Chicken Sausage Pasta or our Instant Pot Spaghetti recipe!